All you need is somewhere in your home or office that gets at least 1 bar of 3G or 4G signal to enable the Cel-Fi PRO to provide indoor coverage. Simply place the Cel-Fi PRO boxes inside your home and enjoy having great 3G/4G mobile reception. The indoor coverage is determined by several factors including the mobile signal strength at the Network Unit and the amount of walls in your home. No longer will you need to go outside or be in a particular room of your house to make a phone call. Slow internet speeds on your mobile device are often caused by low signal. If you suffer from low signal in your home you will be able to relate to the frustration of trying to access email or the internet. The Cel-Fi PRO will amplify the available LTE/HSPA mobile signal and increase your data speeds dramatically. Email, internet, video and social networking speeds will be like you never left the office. Instead of purchasing fixed home broadband services, you can now use your mobile broadband as your primary internet source and save on internet costs. Mobile phones use a lot more energy when in poor signal areas. The phone adjusts its internal power to compensate in an attempt to boost the poor signal. As a result the phone will consume a lot more battery power. Using the Cel-Fi PRO system your indoor mobile signal should be high and the battery will last noticeably longer for you to work, talk, check Facebook and browse the internet. The quality of a voice call is usually determined by the phone’s signal strength and nearby interference. With improved signal strength inside your home and no interference, the Cel-Fi PRO will provide crystal clear voice quality for your mobiles. Amplifies and disburses a Telstra 3G/4G/HSPA/LTE mobile signal. Fully wireless, plug and play that can be setup by the end user in minutes. Provides a coverage area up to 900m2. Automatic Gain Control to deliver maximum signal boost, whilst protecting the mobile network. 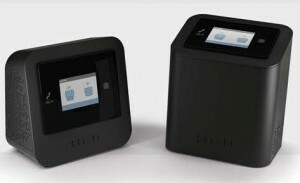 Network-Safe protection that monitors mobile base stations in real time to ensure the Cel-Fi PRO does not interfere with the normal function of the mobile network. Intelligent antenna system with multiple inbuilt antennas to ensure maximum signal reception. Optional external antenna port, for connecting an outdoor antenna. Bluetooth Connectivity for remote access with Smartphone App. A typical setup involves placing the Network Unit (NU) in an area within the building that gets the best possible mobile signal. This would usually be an upstairs window or a window at one end of the house. The Coverage Unit (CU) is then placed within the main area of the house, or in an area that provides the best indoor signal dispersion. 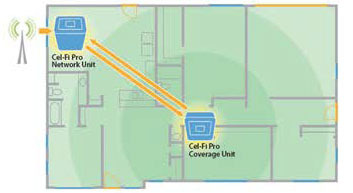 There is a wireless link between the Network Unit and the Coverage Unit. The Coverage Unit has a LED indicator with a numbering system from 0-9 representing the output power. Ideally you require 7 to 9 to ensure maximum indoor coverage. If the CU is close to the NU it will display a low number, as you move it further away the numbers should increase up to 9 bars. At the same time the indoor coverage also increases.